If you guessed Dubrovnik, Croatia, then you are correct! Our owners, Kem & Lori, just returned from a 2 week tour of Italy, Croatia, and Greece, which they described as “a trip of a lifetime”. One city in particular that they will never forget is Dubrovnik, Croatia. Browse their stunning photos below, and look out for our upcoming guides to all of the cities they visited, coming to the blog next week! We’ll be breaking down each city by where to stay, what to eat & drink, and what to do. Lori & Kem traveled with a group of three other couples, pictured above exploring Dubrovnik. As we hinted at in our email, Dubrovnik is the frequent setting for films and television. 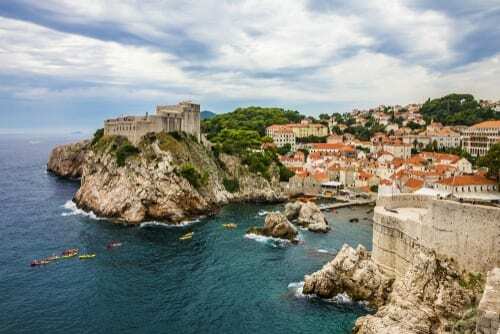 Most recently and very notably, it is the setting for the fictional city of King’s Landing on HBO’s hit show Game of Thrones. In addition, Dubrovnik has recently welcomed Benicio Del Toro and Laura Dern, who are currently filming Star Wars: Episode VIII in the stunning city. Robin Hood: Origins, produced by Leonardo DiCaprio, also shot here in 2017. The city is known for its famous imperious walls. The imposing walls that surround the city are up to six meters thick in some areas, and have never once been breached by a hostile army. The walls are what qualified Dubrovnik as a UNESCO World Heritage site. It takes about an hour to make the full circuit along the battlements of the walls. This hour also gives you time to stop for the stunning panoramic views of the city and the Adriatic Sea. The twisting streets of Dubrovnik’s Old Town will transport you back to a time long ago. You can spend an entire day walking through the hidden alleyways throughout the area. Placa is Dubrovnik’s main street, where you are sure to find a cafe or bar to relax after exploring. Finally, for the best view of Dubrovnik, take the cable car to the crest of Mount Srd. Kem & Lori got to experience this at nighttime since the cable car operates until midnight in peak months. Check out the view they had, above. Call us today at 402-281-3022 to talk to one of our Europe specialists! And stay tuned for more to come on Lori & Kem’s Italian trip of a lifetime.